Our previous posts were about code signing in Android, and they turned out to be surprisingly relevant with the announcement of the 'master key' code signing Android vulnerability. While details are yet to be formally released, it has been already patched and dissected, so we'll skip that one and try something different for a change. This post is not directly related to Android security, but will discuss some Android implementation details, so it might be of some interest to our regular readers. Without further ado, let's get closer to the metal than usual and build a wireless Android device (almost) from scratch. Android support for AM335x-based devices is provided by the rowboat project. It integrates the required kernel and OS patches and provides build configurations for each of the supported devices, including the BBB. The latest version is based on Android 4.2.2 and if you want to get started quickly, you can download a binary build from TI's Sitara Android development kit page. All you need to do is flash it to an SD card, connect the BBB to an HDMI display and power it on. You will instantly get a fully working, hardware-accelerated Jelly Bean 4.2 device you can control using standard USB keyboard and mouse. If that is all you need, you might as well stop reading here. Our first requirement, however is a working touch screen, not an HDMI monitor, so we have some work to do. As it happens, a number of LCD capes are already available for the BBB (from circuitco and others), so those are our first choice. We opted for the LCD4 4.3" cape which offers almost reasonable resolution and is small enough to be directly attached to the BBB. Unfortunately it doesn't work with the rowboat build from TI. To understand why, let's take a step back and discuss how the BBB supports extension hardware, including capes. If you look at the expansion header pinout table in the BBB reference manual, you will notice that each pin can serve multiple purposes, depending on configuration. This is called 'pinmuxing' and is the method modern SoC's use to multiplex multiple peripheral functions to a limited set of physical pins. The AM335x CPU the BBB uses is no exception: it has pins with up to 8 possible peripheral functions. So, in order for a cape to work, the SoC needs to be configured to use the correct inputs/outputs for that cape. The situation becomes more complicated when you have multiple capes (up to 4 at a time). BBB capes solve this by using EEPROM that stores enough data to identify the cape, its revision and serial number. At boot time, the kernel identifies the capes by reading their EEPROMs, computes the optimal configuration (or outputs and error if the connected capes are not compatible) and sets the expansion header pinmux accordingly. Initially, this was implemented in a 'board file' in the Linux kernel, and adding a new cape required modifying the kernel and making sure all possible cape configurations were supported. Needless to say, this is not an easy task, and getting it merged into Linux mainline is even harder. Since everyone is building some sort of ARM device nowadays, the number of board files and variations thereof reached critical mass, and Linux kernel maintainers decided to decouple board specific behaviour from the kernel. The mechanism for doing this is called Device Tree (DT) and its goal is to make life easier for both device developers (no need to hack the kernel for each device) and kernel maintainers (no need to merge board-specific patches every other day). A DT is a data structure for describing hardware which is passed to the kernel at boot time. Using the DT, a generic board driver can configure itself dynamically. The BBB ships with a 3.8 kernel and takes full advantage of the new DT architecture. Cape support is naturally implemented using DT source (DTS) files and even goes a step further than mainline Linux by introducing a Cape Manager, an in-kernel mechanism for dynamically loading Device Tree fragments from userspace. This allows for runtime (vs. boot time) loading of capes via sysfs, resource conflict resolution (where possible), manual control over already loaded capes and more. Going back to Android, the rowboat Android port is using the 3.2 kernel and relies on manual porting of extension peripheral configuration to the kernel board file. As it happens, support for our LCD4 cape is not there yet. We could try to patch the kernel based on the 3.8 DTS files, or take the plunge and attempt to run Android using 3.8. Since all BBB active development is going on in the 3.8 branch, using the newer version is the better (if more involved) choice. Note that the kernel alone is not enough though: the boot loader (Das U-Boot) needs to be able to load the (flattened) device tree blob, so we need to build a recent version of that as well. Android seems to run OK with this configuration, but there are still a few things that are missing. The first you might notice is ADB support. Once this is done, you can reboot and you should see your device using adb devices soon after the kernel has loaded. Now you can debug the OS using Eclipse and push and install files directly using ADB. That said, this won't help you at all if the device doesn't boot due to some kernel misconfiguration, so you should definitely get an FTDI cable (the BBB does not have an on-board FTDI chip) to be able to see kernel messages during boot and get an 'emergency' shell when necessary. Android's ActivityManager uses Linux control groups (cgroups) to run processes with different priorities (background, foreground, audio, system) by adding them to scheduling groups. In the mainline kernel this is only allowed to processes running as root (EUID=0), but Android changes this behaviour (naturally, with a patch) to only require the CAP_SYS_NICE capability, which allows the ActivityManager (running as system in the system_server process) to add app processes to scheduling groups. To get rid of this warning, you can disable scheduling groups by commenting out the code that sets up /dev/cpuctl/tasks in init.rc, or you can merge the modified functionality form Google's experimental 3.8 branch (which we've been trying to avoid all along...). This finally settles it, so we can cross requirement #1 off our list and try to tackle #2 -- wireless support. 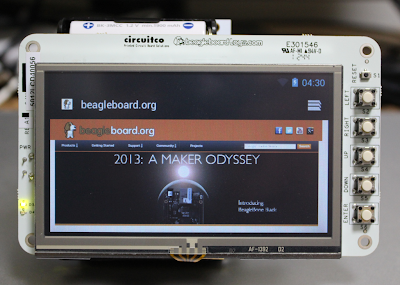 The BBB has an onboard Ethernet port and it is supported out of the box by the rowboat build. If we want to make our new Android device mobile though, we need to add either a WiFi adapter or 3G modem. 3G support is possible, but somewhat more involved, so we will try to enable WiFi first. There are a number of capes that provide WiFi and Bluetooth for the original BeagleBone, but they are not compatible with the BBB, so we will try using a regular WiFi dongle instead. As long as it has a Linux driver, it should be quite easy to wire it to Android by following the TI porting guide, right? We'll use a WiFi dongle from LM Technolgies based on the Realtek RTL8188CUS chipset which is supported by the Linux rtl8192cu driver. In addition to the kernel driver, this wireless adapter requires a binary firmware blob, so we need to make sure it's loaded along with the kernel modules. But before getting knee-deep into makefiles, let's briefly review the Android WiFi architecture. Like most hardware support in Android, it consists of a kernel layer (WiFi adapter driver modules), native daemon (wpa_supplicant), HAL (wifi.c in libharware_legacy, communicates with wpa_supplicant via its control socket), a framework service and its public interface (WifiService and WifiManager) and application/UI ('WiFi' screen in the Settings app, as well as SystemUI, responsible for showing the WiFi status bar indicator). That may sound fairly straightforward, but the WifiService implements some pretty complex state transitions in order to manage the underlying native WiFi support. Why is all the complexity needed? Android doesn't load kernel modules automatically, so the WifiStateMachine will try to load kernel modules, find and load any necessary firmware, start the wpa_supplicant daemon, scan for and connect to an AP, obtain an IP address via DHCP, check for and handle captive portals, and finally, if you are lucky, set up the connection and send out a broadcast to notify the rest of the system of the new network configuration. The wpa_supplicant daemon alone can go through 13 different states, so things can get quite involved when those are combined. In order to build the wpa_supplicant daemon, we then set BOARD_WPA_SUPPLICANT_DRIVER and WPA_SUPPLICANT_VERSION in device/ti/beagleboneblack/BoardConfig.mk. Note the we are using the generic wpa_supplicant, not the TI-patched one and the WEXT driver instead of the NL80211 one (which requires a proprietary library to be linked in). Since we are preloading driver kernel modules, we don't need to define WIFI_DRIVER_MODULE_PATH and WIFI_DRIVER_MODULE_NAME. To make the framework aware of our new WiFi device, we change networkAttributes and radioAttributes in the config.xml overlay file. Getting this wrong will lead to Android's ConnectionManager totally ignoring WiFi even if you manage to connect and will result in the not too helpful 'No network connection' message. "1" here corresponds to the ConnectivityManager.TYPE_WIFI connection type (the built-in Ethernet connection is "9", TYPE_ETHERNET). That was easy, right? We now have a working wireless connection, it's time to think about requirement #3, powering the device. 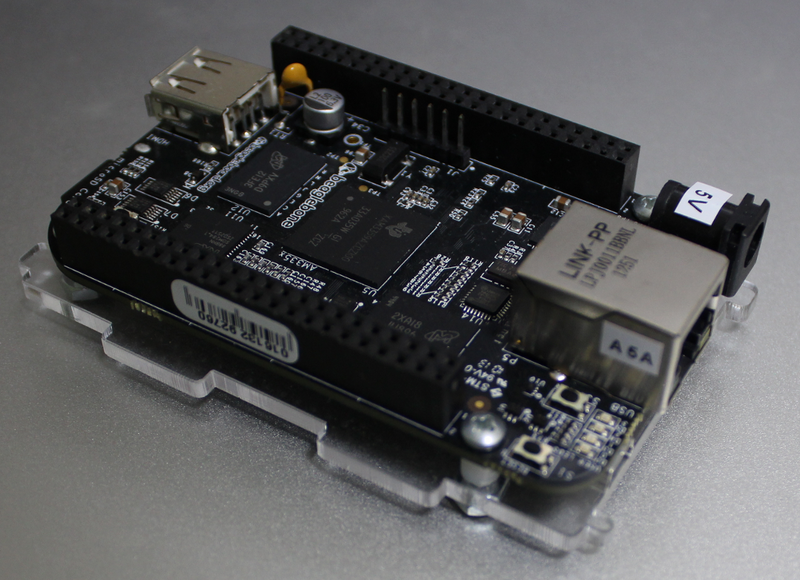 The BBB can be powered in three ways: via the miniUSB port, via the 5V AC adapter jack, and by using the power rail (VDD_5V) on the board directly. We can use any USB battery pack that provides enough current (~1A) and has enough capacity to keep the device going by simply connecting it to the miniUSB port. Those can be rather bulky and you will need an extra cable, so let's look for other options. As can be expected, there is a cape for that. The aptly named Battery Cape plugs into the BBB's expansion connectors and provides power directly to the power rail. We can plug the LCD4 on top of it and get an integrated (if a bit bulky) battery-powered touchscreen device. The Battery Cape holds 4 AA batteries connected as two sets in parallel. It is not simply a glorified battery holder though -- it has a boost converter that can provide stable 1A current at 5V even if battery voltage fluctuates (1.8-5.5V). It does provide support for monitoring battery voltage via AIN4 input, but does not have a 'fuel gauge' chip so we can't display battery level in Android without adding additional circuitry. That is ways our mobile device cannot display the battery level (yet) and unfortunately won't be able to shut itself down when battery levels become critically low. That is something that definitely needs work, but for now we make the device always believe it's at 100% power by setting the hw.nobattery property to true. The alternative is to have it display the 'low battery' red warning icon all the time, so this approach is somewhat preferable. Four 1900 mAh batteries installed in the battery cape should provide enough power to run the device for a few hours even when using WiFi, so we can (tentatively) mark requirement #3 as fulfilled. If you have been following Andrew Henderson's build guide linked above, you have been 'installing' Android on an SD card and booting the BBB from it. This works fine and makes it easy to fix things when Android won't load by simply mounting the SD card on your PC and editing or copying the necessary files. However, most consumer grade SD cards don't offer the best performance and can be quite unreliable. As we mentioned at the beginning of the post, the BBB comes with 2GB of built-in eMMC, which is enough to install Android and have some space left for a data partition. On most Android devices flashing can be performed by either booting into the recovery system or by using the fastboot tool over USB. The rowboat build does not have a recovery image, and while fastboot is supported by TI's fork of U-Boot, the version we are using to load the DT blob does not support fastboot yet. That leaves booting another OS in lieu of a recovery and flashing the eMMC form there, either manually or by using an automated flasher image. The flasher image simply runs a script at startup, so let's see how it works by doing it manually first. The latest BBB Angstrom bootable image (not the flasher one) is a good choice for our 'recovery' OS, because it is known to work on the BBB and has all the needed tools (fdisk, mkfs.ext4, etc.). After you dd it to an SD card, mount the card on your PC and copy the Android boot files and rootfs archive to an android/ directory. You can then boot from the SD card, get a root shell on the Angstrom and install Android to the eMMC from there. Android devices typically have a boot, system and userdata parition, as well as a recovery one and optionally others. The boot partition contains the kernel and a ramdisk which gets mounted at the root of the device filesystem. system contains the actual OS files and gets mounted read-only at /system, while userdata is mounted read-write at /data and stores system and app data, as well user-installed apps. The partition layout used by the BBB is slightly different. The board ootloader will look for the first stage bootloader (SPL, named MLO in U-Boot) on the first FAT partition of the eMMC. It in turn will load the second state bootloader (u-boot.img) which will then search for a OS image according to its configuration. On embedded devices U-Boot configuration is typically stored as a set of variables in NAND, replaced by the uEnv.txt file on devices without NAND such as the BBB. Thus we need a FAT boot partition to host the SPL, u-boot.img, uEnv.txt, the kernel image and the DT blob. system and userdata will be formatted as EXT4 and will work as in typical Android devices. Next, we mount boot and copy boot related files, then mount rootfs and untar the rootfs.tar.bz2 archive. usrdata can be left empty, it will be populated on first boot. With this, Android is installed on the eMMC and you can shutdown the 'recovery' OS, remove the SD card and boot from the eMMC. Note that the U-Boot used has been patched to probe whether the SD card is available and will automatically boot from it (without you needing to hold the BBB's user boot button), so if you don't remove the 'recovery' SD card, it will boot again. Our device is unlikely to win any design awards or replace your Nexus 7, but it could be used as the basis of dedicated Android devices, such as a wireless POS terminal or a SIP phone and extended even further by adding more capes or custom hardware as needed. The BBB is fully capable of running Android and by adding off-the shelf peripherals you can easily turn it into a 'tablet' (of sorts) by adding a touch screen and wireless connectivity. While the required software is mostly available in the rowboat project, if you want to have the best hardware support you need to use BBB's native 3.8 kernel and configure Android to use it. Making hardware fully available to the Android OS is mostly a matter of configuring the relevant HAL bits properly, but that is not always straightforward, even with board vendor provided documentation. The reason for this is that Android subsystems are not particularly cohesive -- you need to modify multiple, sometimes seemingly unrelated, files at different locations to get a single subsystem working. This is, of course, not specific to Android and is the price to pay for building a system by integrating originally unrelated OSS projects. On the positive side, most components can be replaced and the required changes can usually be confined to the (sometimes loosely defined) Hardware Abstraction Layer (HAL). the list of devices on running command adb devices. Also i don't find any /sys/class/android_usb/android0/ dir inside /sys/class. Make sure /dev/usb-ffs/adb is mounted, try to mount manually if it is not. android_usb/android0 is for the Android gadget driver, it's not available if you are using FF. Your guide is great! I would like to enable WiFi in my BeagelBone Black (with Kernel 3.2 and the same WiFi chipset). I follow your guide without difficulties. In fact, when I boot I see WiFi in settings, but I cannot enable it. Hope you can give me a hand in order to enable WiFi in my BB Black. You have to build those modules when building the kernel and copy them in your rootfs image. Follow Andrew Henderson's kernel building guide I link for details. Your guide is really good. I was looking for something like this. I have a BBB + LCD4 + Edimax wifi(RTL8188CUS chipset) so having a something that works (your image) is something really helpful. Would you mind sharing the binary image you build? All needed config and make files are on Github, you only need to select the required modules in the kernel configuration. I don't have exactly the same WiFi adapter, so there are no guarantees that this will work as is. If you don't want to build the whole thing, start with Andrew's image and add only the needed files. I don't really have a place to host huge images. Do I have to follow your steps from the beginnig to be able to flash the eMMC? or Can't I just follow the steps in "Flashing the device"? The TI image is designed to boot of the SD card, you need to modify it you want to boot off eMMC. I also have the problem that adb is not working after boot. The directory /dev/usb-ffs/adb was mounted, but there is nothing in the directory. I've compiled the FunctionFS as kernel module, could it be that the module was not loaded on boot? Sadly if got no root console at the moment because I don't have a cable to connect my serial port adapter to the BeagleBone. Android doesn't load modules automatically, so you should insmod in init.rc. Better to build it into the kernel though. Do get a FTDI cable, it's impossible to do any kernel tweaking without one. This question might have been asked to many times but why am I not able to have BBB with Android 4.2.2 Kernel 3.8.13 Auto mount an external Flash Drive either SD-Card or USB Flash Drive? Seems like a lot of people have had this problem but I cannot find a fix?? can anyone help? I am using the same beagle bone black board and the Circuitco-LCD4 (4.3") for my project, can you please share me the 3D part design file(sldprt) of LCD4. Which i need to ensure the mechanical critticality of my project to fit an intermediate board in between of LCD4 and Beagle board. I only used standard components, you should be able to find any design documents on the respective sites. For the LCD4, they should be on the Circuitco site. Great Work Nikolay: Can you make your image available? Adb is mounted for me. I can enumerate ADB device in windows 7. But when I do adb devices i see no devices attached. I followed exact steps you mentioned. What else I need to look? As well the device enumeted does not accept VID PID set in the uEnv.txt file..
really amazing work man. I would like to develop an android app which will move the slides on a ppt when we presss a button on the remote. Ir receiver is placed on the board, when a signal is read I want to move the slide, I donot know what system functions I need to call, can u pls help me..
Hi, I read your amazing post and I tried to do the same work. But I can't use my Wi-Fi dongle by GUI. And I tried to use from CUI. From netcfg command, my dongle is enabled, but I can't wake it up. [ 260.949088] rtl8192cu: MAC auto ON okay! DefConfig File, or the zImage with me, so that i can resolve the same ? I am trying this for long, but with no success, hence would be very thankful to you, if you could help me . Just a small correction. wpa supplicant should be started with option -Dwext. Just like at your gitthub. And for my card rtl8712 firmware should be at /system/etc/firmware. I would like to get the errors from the lack of the Android cgroups patch out of my log. Can you detail what exactly needs to be commented out of the init.rc? Also I can't seem to find the patch to add support to a 3.8.x kernel, do you happen to know where I could find it? Nikolay please can u post a step by step guide of emmc flashing? Im New with it and get totally lost. Do you have the uEnv.txt config file to load zImage for kernel 3.8 with dtbs ?